Are you interested in learning how to do a cartwheel? But you aren’t sure where to start? You can learn a cartwheel in one day, but you will first need to start with a baby cartwheel and then work on perfecting it. In the cartwheel below the gymnast kicks around the side and does a baby cartwheel. Whereas, in the cartwheel above she correctly kicks vertically over her head. As you practice you will get better and better, and be able to do a correct cartwheel. One of the keys to learning a perfect cartwheel is practice. In our article on the power of repetition, we share a personal example about learning how to do a cartwheel. In order to learn the same way as in our story, complete this 1,000 cartwheel challenge. You can download it below. Remember, practice makes perfect! Note: If you aren’t sure if your gymnast should be trying a cartwheel with their right leg going first or their left, there are a couple things you can do. You can have your gymnast do a cartwheel on both sides and see which side is easier and more natural. You can also have your gymnast do a cartwheel over a mat or a block (like here below) and see which way their hands turn. If they naturally turn 90 degrees to the left, they are most likely going to be doing a left cartwheel. And if they turn 90 degrees to the right, they are most likely going to be doing a right cartwheel. 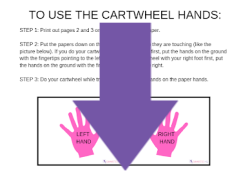 Here are step by step instructions for learning a cartwheel. 1. 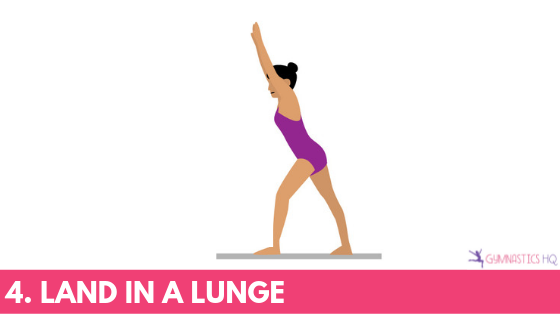 Start in a lunge. To start your lunge, put your dominant leg in front and bend it slightly. Your back leg should be straight. Your arms should be straight above your head, near your ears. 2. Put your hands on the ground. Put your hands on the ground with your hands turned 90 degrees. 3. Kick your feet over your head. 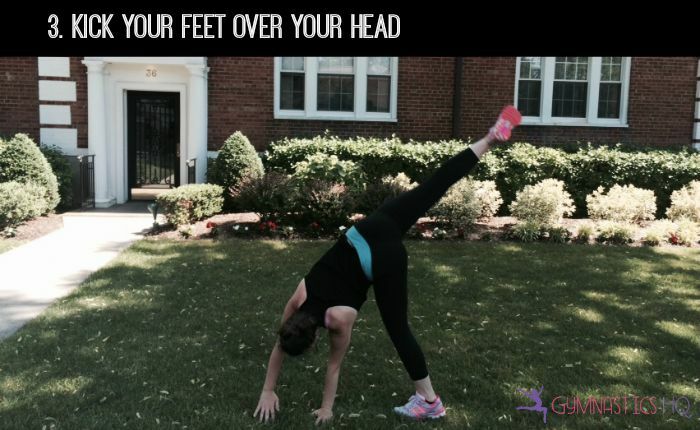 Kick your feet over your head one at a time. The foot that kicks first should land first. 4. Land in a lunge. Land in a lunge facing the opposite direction you started from. Your arms should be over your head near your ears. Your front leg should be slightly bent, and your back leg should be straight. When you are starting out, just try to kick your feet around the side of your body. 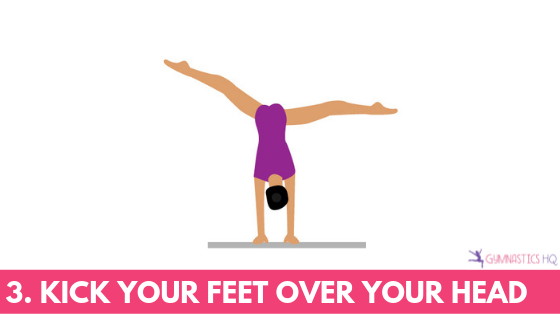 Then, as you work on improving your cartwheel, you can try to kick your feet more over your head. 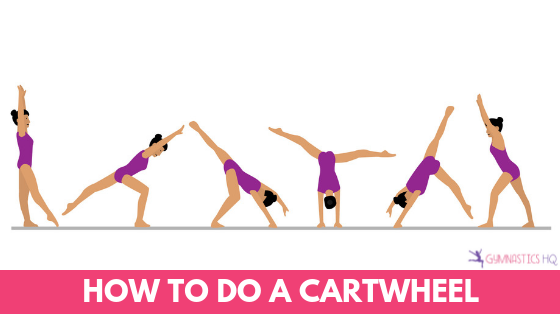 While you can learn a cartwheel without the help of tools, it can be easier to learn one with help. Especially for young gymnasts. My favorite way to teach a cartwheel is to teach it over an object. And this cartwheel block is perfect for learning this way. It’s much easier to kick your feet around or over your head in this method, with your hands being raised a little bit off the ground. Turn your hands 90 degrees to either the right or left (depending on your gymnast’s dominant side). And kick your feet over the block to land on the other side. You can also help determine which side, right or left, will be your gymnast’s dominant side when they are tumbling with this tool. 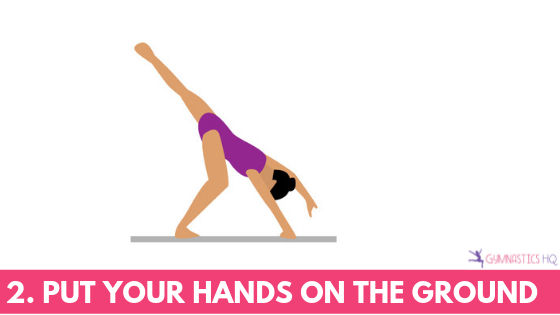 If your gymnast automatically turns her hands 90 degrees to the left, she should probably do a left cartwheel with her left foot in front in her lunge. If she automatically turns her hands 90 degrees to the right, she will probably be doing a right cartwheel. 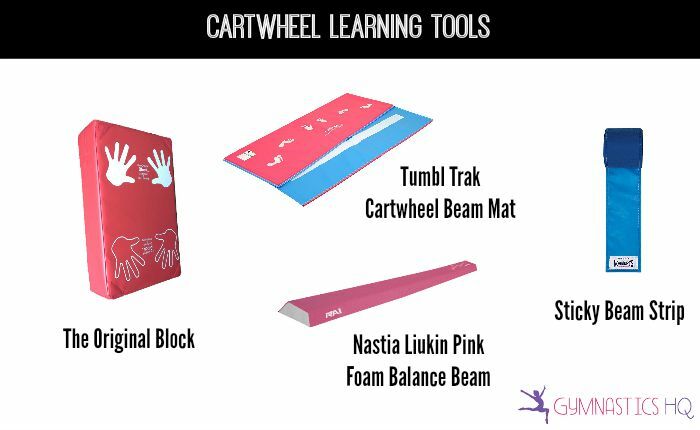 Learning a cartwheel with a cartwheel mat is a great method for preschool children. The foot-prints and hand-prints make it easy for preschool age children to figure out where their hands should go. You can also use the back of this mat to practice doing a cartwheel in a straight line. Once your gymnast has learned a cartwheel, it’s time to make it perfect! One of the ways to make sure your gymnast is doing a straight cartwheel is by doing it on a beam. This foam balance beam is slightly raised, but not enough that your gymnast will hurt herself if she doesn’t land directly on it. A sticky beam strip is a great way to help your gymnast practice on a line, when you don’t want to put chalk or tape on the floors in your house. You can put this strip down, use it to practice, and take it right back up. By practicing your cartwheel on a line, you will make sure you are going right over your head. I hope this helps you master your cartwheel! Once you have mastered your cartwheel, check out 9 other basic gymnastics skills you should master. When you do any type of gymnastic move, you must stretch your muscles. That’s probably where you went wrong. I need to know that as well. Did you remember to point your toes? Try doing the splits in the middle of the cartwheel and landing one foot at a time. My legs are bent when i do it how do i get them straight . Other than that its great! Can you use a mattress while perfecting? How do I make my legs strait? What do you do when your legs aren’t strait? This site is very helpful. I was trying to learn how to do a cartwheel because we are doing a freestyle tinikling routine in my gym class and I was trying to self tech because I learned when I was about 4 or so, but forgot. But, easily once I followed the steps, it all just come back to me and if I practice over the weekend then I’ll be good by Monday! Thank you! 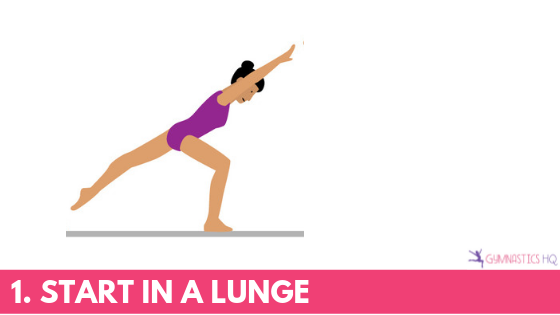 This website was incredibly helpful in teaching me how to do a lunge cartwheel. How do you do the cartwheel if it is on carpet instead of grass? Hi I am in 6th grade and have now just starting cheer for the first time. Any Tips? Also, I can’t do the splits or any kind of leg flexibility movement will I get better over time? Please respond! If you want to do the splits, all you need to do is stretch every day. If you search online, there’s lots of stretching exercises for splits. Sprinting also helps because you move your legs really wide. I did the kneeling quad stretch and I sprinted 2/3 times a week for 30 minutes and it took me 3 months to do the splits.